On Saturday, I mentioned that I had made a class sample for my upcoming Quilting on Your Domestic Machine class that I will be teaching at Bolts in the Bathtub on September 18th, and I finally have the time to tell you more about the walking foot whole cloth quilt I made! The mini quilt layout was inspired by some pattern testing that I had the pleasure of doing recently. As I am unable to tell you about that particular bit of secret sewing right now, I thought I would translate a bit of that into this mini quilt, and I am thrilled with the art deco vibe of the layout. To create the layout, I pressed the block to create an initial grid and used occasional marking lines made using a Clover Fine White Marking Pen (not an affiliate link). I personally like how easy it is to remove the clover marks with a bit of heat from my iron. I included areas of dense matchstick quilting to use as a reminder to talk about how I approach doing matchstick quilting, some dot to dot inspired motifs, and creative ways to travel around and fill areas by creating subdivisions of a block. I tried to emphasize what might be considered traditional “blocks” by going over particular “seam lines” repeatedly. 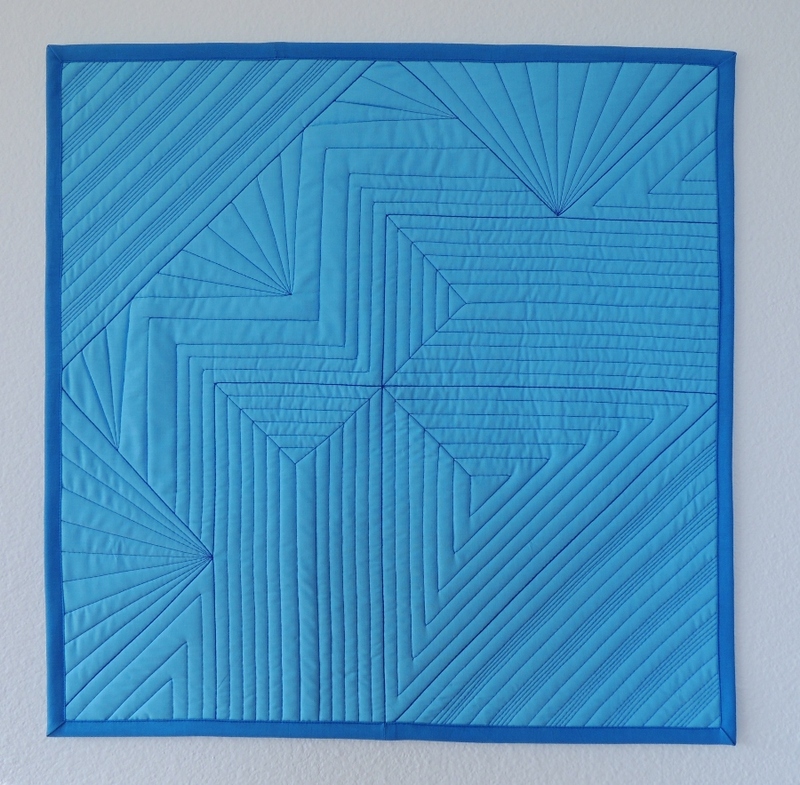 The mini quilt is made using Michael Miller Cotton Couture in Wave for the front and back, and the binding is Cotton Couture in Blue. The quilting was done on my domestic machine, Olive (a Bernina 820), using 50wt Aurifil 2735 (Medium Blue). If you have ever done a whole cloth quilt before, would you consider doing an entirely straight line version of one? I am definitely itching to play around with that idea more after this mini quilt! I like it, specially the corner with 5 lines together, a space, one line then repeated. Super spacing on all the rest with triangles as well. Yes, I would do one, on my Bernina QE 440, as I so hesitate to do a whole sized quilt. That is such a striking piece. 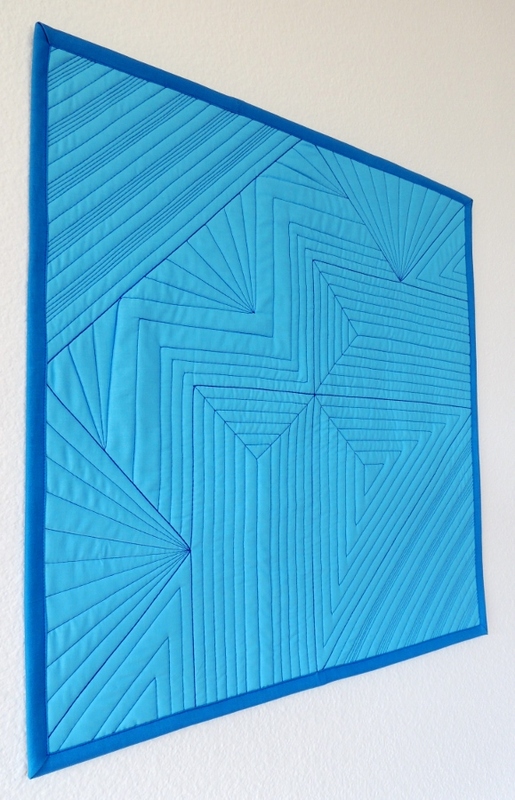 Now I’m itching to do some straight line quilting, too. You definitely rocked this one Yvonne. Straight lines never looked so good. Wow! Love the quilting you did on this min quilt! Was there a strategy on how you did your quilting? Do you do one area at a time or do you stabilize all the areas and then go back and fill in? Thanks for sharing! I’d definitely consider doing an all-straight-line wholecloth, but it would have to be relatively small. 😉 Straight lines sometimes drive me nuts! I love how you outlined parts of the quilt to show where blocks might be. It looks like it will be a great class. I haven’t really considered doing a whole cloth quilt on the machine, but I am playing with some hand quilted whole cloth projects. Looking at your mini quilt… hearing how you broke down the sections… you definitely inspire me to want to try it myself! Your class should be a huge success! Looks like fun – could really play with colours too with this approach. I did a whole cloth FM but never straight line and I really like the texture! I love the clean lines and art deco look of this mini. What size is it finished? I’ve done one whole cloth by hand but none by machine. Your lines always look so straight and your attention to detail is really impressive. I haven’t tried the Clover white pen…does it work like the Fixon pens but maybe with less work about it’s permanence? This bit of quilty goodness reminds us that lines and the walking foot can make a huge statement quilting wise. It looks very cool. This would be such a fun class. This looks fantastic and what fun you must have had creating it. It is very inspiring that I think I could do this. I’ll have to wait until I get back home in September and get my Bernina fixed (taking it in the 5th wheel was not a good idea). Seeing this makes me want to try too! I did something similar (but much simpler!) on a “Plus” pieced table runner, but whole cloth really shows off your quilting design beautifully. Very cool! I really like the effect of having a bunch of closer spaced lines alternating with larger spaces. How big is the quilt? Your class is going to be awesome! I really like this and definitely want to try it … Try being the operative word but I am going to … try. It looks great!! I wish I lived closer so I could take your class. This is an interesting piece. There is something about this quilt that I absolutely love. Very nice! I have done a couple whole cloth quilts (throw sized), but featured a medallion surrounded with a lattice layout and fans in the corner. Falling more and more in love with the modern style. Thanks for the inspiration.